Heilbronn, September 2017: The 2017 BRICS Summit was held in Xiamen, China. BRICS is attended by the country leaders from Brazil, Russia, India, China and South Africa stretching across four continents. Collectively, the members of BRICS accounts for about 30% of the world’s territories, and about 40% of the world’s population. On the evening of September 4th, Chinese leaders provided a warm reception to the heads of states who were present at the meeting, in which an evening gala was held at the Banlam Grand Theater. China Central Television, including channels of CCTV-1, CCTV-3 and CCTV-4, broadcasted the gala live to audiences across the globe. In the evening gala, 200-channels of beyerdynamic TG 1000 digital wireless microphones were used in piano ensembles, Chinese instrumental ensembles, other muscians and vocalists (lead & chorus). An additional 20-channel wireless was made available for backup & redundancy. Collectively with other brands, nearly 240-channels of wireless microphones and 100-channels of wired microphones were deployed on sites. Under such a complicated operating environment, all 200-channels of TG 1000 digital wireless microphones were fired up and on standby mode, and non of them were powered down, until all performances were completed. With the audience being heads and leaders of countries, and the performances being broadcasted live to TV audiences across the globe, it is imaginable that the intensity of technical challenges was huge. Throughout the course of preparation from organizing the equipment to on-site installation and calibration, chief acoustic designer, Mr. Tian Chensheng, worked out a detailed audio design proposal in April 2017 in Beijing, and called for numerous meetings with the acoustic retransmission team from CCTV, director of the audio department, Mr. Chen Chen, and the general manager of Eastern Acoustic Development (EAD), Mr. Situ Guangwen, to discuss equipment configurations. After arriving at the performance site at Banlam Grand Theater on July 30, Mr. Tian made adjustments to part of the design scheme by building a wireless microphone system consisting of more than 200-channels for live TV broadcasting, an unprecedented case in China, or even in the entire world. The preparation work was taken on by EAD Digital Technology, Distributor of beyerdynamic in China. Chief technical engineer Mr. Cheng Yulin deployed his team at the site of Banlam Grand Theater multiple times over a period of 2 months. The wireless frequency conditions in the performance venue were notoriously harsh given the vast and intense security intercom system deployed in such an important international event. Using the 470 Mhz-789 Mhz wide-band spectrum scanning technology provided by TG 1000, EAD engineers initiated strict monitoring of on-site radio frequency variations, followed by numerous system planning and adjustments. The superb stability and flexibility that the TG 1000 system provided have enabled experienced engineers from EAD to ultimately create the most remarkable project case in history – the largest number of wireless microphone channels to be employed in a single site. In the meantime, the professional expertise built over nearly a century by beyerdynamic has been proved yet another time. Let us run through the impressive scenes in the gala. In the Golden Hall of the Banlam Grand Theater, the “shoe box” layout of the auditorium can accommodate 1497 audience. The overall stages adopt an internationally prevailing “T”-shaped design, in which the main stage covers an area 3 times the size of the auditorium! With a proscenium arch of 18 x 12 meters, the main stage is 31.1 meters in width and 23.4 meters in depth; putting the side-stages at both flanks together would make it a size of 70 meters in width and 46.5 meters in depth. 8 WA-ATDA active directional antennas were installed on both sides of the stage, ensuring that the numerous TG 1000 beltpack transmitters used by the chorus could be always within the coverage of signals. After being amplified on WA-AMP2, the signals were transmitted to WA-ZPAD for integration, and then sent to 24 TG 1000 digital receivers via 5 WA-AS6 signal distributors. Yes, that’s right – 24 machines! The secret lies in the function of a cascade connection for antennas offered by TG 1000 digital receivers. Each principal machine can extend loss-free signals to 6 (12-channel) machines through cascade connection. In this case, the reserved capacity for RF signals reaches 24 routes x 6 – a total of 144 receiving machines (288-channels). The gala evening consisted of five chapters including Wind from the Sea, Sky and the Sea, Rhythm of the Sea, Tide and the Sea as well as the Dream from the Sea. 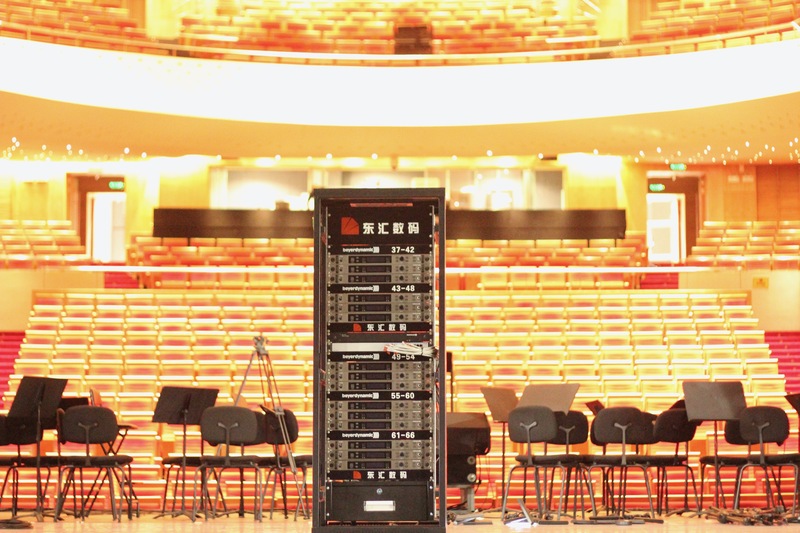 When the first performance – large-scale dance Wind from the Sea was on show, 40 TG 1000 beltpack transmitters were equipped on orchestral instruments of China National Symphony Orchestra. The second chapter Sky and the Sea was a piano and violin duet. With a mechanical elevating stage being used, the piano was required to horizontally removed to the center of the stage, wired microphones thus could not be used for picking up the sound. 10 TG 1000 beltpack transmitters were ingeniously concealed beneath the piano and inside the costume of the violinist. In addition, there was almost no signal compression thanks to the digital transmission technology applied in the system, helping incisively and vividly bring out the details of the piano performance. In the Banlam-fashion chorus Rhythm of the Sea, the actress leading the song was dressed in national costume whose performance was accompanied by music played by instruments with distinct Chinese characteristics, in which 40-channel TG 1000 beltpack transmitters equipped with TG L58 clip-on microphones were used. In the following chapter, Tide and the Sea, a children’s chorus, 36-channel TG L58 clip-on microphones and TG 1000 beltpack transmitters were also used. To fit into different costume colors, skin-toned and black TG L58 microphones were respectively deployed on them. In this way, the clip-on microphones wouldn’t be easily spotted even in zoom-in camera shots, thus ensuring zero influence on the visual effects on the stage. In the final chapter, the orchestra chorus Dream from the Sea, TG 1000 beltpack transmitters equipped with 54-channel TG L58 clip-on microphones were used for the vocal chorus.